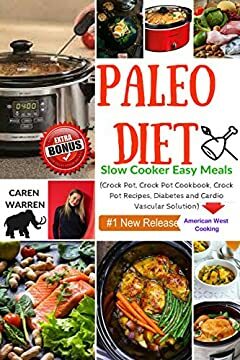 Learn how to create easy, delicious Paleo Diet Slow Cooker meals! This is not weight loss program that sometimes makes you worse off than before you started. Unlike normal diets Paleo naturally balances hormone levels. It is based on pre-historic human life style and focused on real food like meat, fish, eggs, vegetables, fruits and nuts. Challenge yourself to transform your health by following 'The Paleo Diet Recipes for Beginners. Slow Cooker Easy Meals' by Caren Warren! Diabetes is the 7th leading cause of death now, just in the USA, according to the Academy of Nutrition and Dietetics. So, today you have a great chance to get a quick overview of one of the best choices you can make in regards to health and natural way of eating. Yes, the Paleo Diet! Your health is all year round adventure and you need to be prepared for whatever may come your way.